Good morning Upper East Siders.. Glossie Girl here! Your look into the scandalous lives of Manhattan's fashion elite. 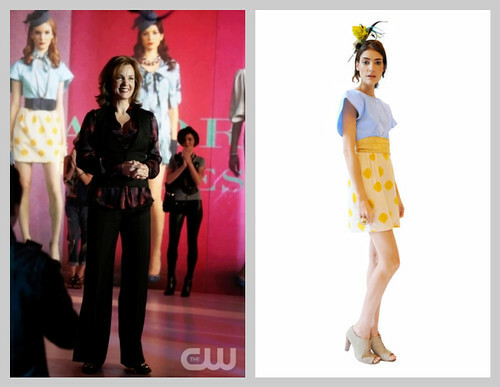 We all remember when little Jenny Humphrey hijacked Eleanor Waldorf's fashion show a few seasons ago.. Well, Abigail Lorick was the actual designer behind the fictional line and her fabulous frocks have been playing a starring role in the wardrobes of many of the characters ever since. Coming up on this Monday's episode, Lorick will be taking over the runway in the form of Eleanor Waldorf's line once again. I don't know what the story line is, but I do know which dresses will be featured! The Lorick pieces shown are from the Spring '10 collection. They should have an interactive purchase feature where the clothes are available to buy online during and after the show! Now that would be awesome. You should check out Lorick's website. It is beautifully done and reflects the feminine sensibility and spirit of the line.